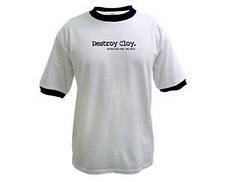 I just refurbished the "Destroy Cloy" T-shirt. After I e-mailed my pastor, he made a couple of suggestions, but in general, he really liked it! Once again, if you can't read it from the picture, it says, "Destroy Cloy." And then in small print, "Go for Real Joy! (Ps. 16:11)"